Today is the day I realized I’ve outgrown Forever 21. I wanted to go there and find some cheap blazers to wear for work. I remembered getting some cute ones before and thought I could pick up a few to round out my summer business wear. Apparently, the Forever 21 of my memories doesn’t exist anymore. The first thing I saw when I walked in was a bunch of crop tops. I should have known it would only be downhill from there. I looked around, attempting to find anything worth trying on within the overly-packed-displays. I’m sure the store is organized in some fashion, but I had the hardest time finding any rhyme or reason to how things were arranged. With that said, though, there was a section for bedazzled clothes. So, if I needed something bedazzled I was covered. 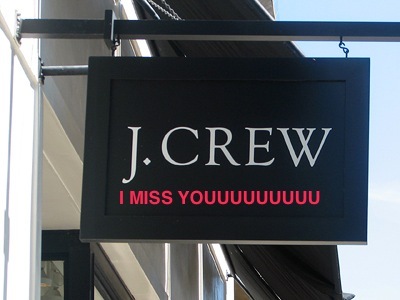 As I trudged through the mess (and I mean mess) of clothes, I kept wishing that I were in J.Crew with the nice spaced out displays where you can actually see the clothes. But, of course, our store closed a few months ago. The gaping hole in that mall and my heart will never truly be fixed. I ended up finding one cherry red blazer that looked decent and then a few dresses I impulsively picked up because I can’t resist a good dress. There was one blazer I saw that was actually really striking – 60’s swing style with tweed and black lining. And then I saw it was $42.00. Anyway, the Forever 21 employee who I’m convinced was just out of junior high led me to a dressing room and I set out on on the sometimes-fruitful-mostly-awful task of trying on what I had chosen. The blazer went first since it was what I actually went there to buy, and while it wasn’t awful something about it didn’t look exactly right on me so I put it to the side. The dresses were next, and while both of them looked like a normal length on the rack, they ended up hitting inches from my baby maker. The sad thing is that these were the longer dresses in the store. Others were much shorter and I’m guessing are in danger of bringing the idea of flaunting your femininity to a very literal level. I made another short round after the dressing room to see if I had missed anything, but a row of bustiers scared me and I left. I know Forever 21 always had some edgier clothing, but considering that its main audience is high school students, I found the amount of overly-sexualized clothing bothersome. I mean, no one except Madonna circa-1987 should be wearing bustiers. Bottom line, Forever 21 and I have officially parted due to irreconcilable differences. It was time. So, good riddance Forever 21. I’m sure there will be enough teeny-boppers and beyond to keep you in business for many, many years to come. As for me? Yesterday I had my first day at my summer externship and despite bouts of paranoia and a full bladder (more on that later) I made it through the whole eight hour day. My previous internships had all ended at 2 or 3 because I would have class after, so this going until 5 thing was new to me. What did I learn? Well, here is one thing for each hour I was there. 1. Commuters deserve medals. I had to be up at 5:15 to catch a 6:55 train that got me in the city early enough for me to catch a bus that goes to my building. I’m dreading doing this three times a week for the summer and there are people who do this every day. I tip my figurative hat to them and wish them rest in their retirement (because we all know they’re not getting it now). 2. The receptionist with the bathroom key is your best friend. To keep myself alert during the day I drink a lot of water/tea/coffee which translates into a handful of bathroom runs. Be nice to the receptionist. She holds the key (literally) to your bodily comfort. 3. Hour lunch breaks are rrrreeeeaaaallllyyy long. I never took a full break at my other internships. I would eat at my desk and end up working about twenty minutes in. Yesterday, though, I went down to the cafeteria with a book and set out to stay down there for the full hour. I ended up going back to the office after thirty minutes. What are you supposed to do for the full hour? 4. No matter how hard you try, the new computer will confuse you. I’m not particularly tech-savvy, but after my other internships I thought I had a pretty good grasp on using PCs. Nope. Definitely not true. 5. On the topic of other internships, just because you used a fax machine there three months ago doesn’t mean you will remember how to use it. I’m dreading the day they ask me to fax something or change the ink in the printer, because I will have no idea what to do. 6. You will be awkward with everyone. One of my supervisors was explaining this project and asked me where my family was from to illustrate a point. I thought he meant my parents and I told him they were from Chicago, but I didn’t know the town names. I realized later he meant where I was from, not my parents. So, basically, it looked like I didn’t know what town I was from. Awkward. 7. Bring snacks. I ate breakfast at 6:00, so by the time I got to work I was starving. For the rest of my time there I will be bringing an arsenal of snacks with me. My desk is basically going to moonlight as a convenience store. 8. Eight hours is a long time, but if you like what you’re doing it’s really not that bad. This probably will not come as a surprise to any of you, but I am a total nerd. It started when I was little and my dad sat my brother and I down to watch all of the original Star Wars. I loved those movies – so much better than all the Indiana Jones movies we would alternatively watch – and I started collecting memorabilia pretty early. When I was in grade school, almost every bit of my bedroom was covered with posters. I had countless books, a Princess Leia costume, and a collection of action figures that even at my young age I refused to take out of their packaging lest they lose their value. My Queen Amidala barbie got to see some action, though. I used to have her and a 90210 Ken that I randomly owned act out scenes from Titanic. I always had them trying to outrun gushing water in the ship’s corridors. That apparently was the extent of my imagination at that age. In case you’re thinking, “What is a Queen Amidala? !”, here you go. It was the coolest Barbie ever because you got to do a bunch of stuff to her hair. There was even a guide that showed you how to make the different hair styles. It was an awesome toy until I lost about half of the hair pieces. That’s when Queen Amidala started cavorting with Jack Dawson on the Titanic. Since I’ve grown up (it terrifies me that I can now use that phrase, btw) my taste for geeky memorabilia has not tempered. I don’t buy dolls anymore (or action figures) but I still love a good themed item. My latest goodie (actually mom Mom bought it for me – but she KNEW it was my type of thing) is a coffee cup with Doctor Who’s Tardis (his space ship) disappearing on one side of the mug when you add your coffee and then reappearing on the other side. Oh hey, Tardis chilling in the city. Add coffee — It’s starting to appear on the other side! And it’s on the other side! Alright, now that you sat through four gratuitous pictures of my Tardis mug (you’re all such good sports) I will reward you with a recipe. Last semester during finals I had the worst eating habits. It was all prepared sandwiches from school and that one Taco Bell meal that had be rethinking my existence on this Earth. This time around, I told myself I would cook more. And I did! I’m trying to cook through my refrigerator and when I found an unopened bag of frozen cauliflower in my freezer I knew exactly what I was going to do with it. I am a firm believer that buffalo sauce tastes good on anything. I’ve tried it on a bunch of random stuff, and there hasn’t been one combination that I didn’t like. Granted, I’ve never tried it on dessert. Anyone game for some buffalo cupcakes? Anyhoo, it is definitely not gross on cauliflower. One of my friends made a permutation of this for our super bowl party, and I’ve been wanting to try my hand at it for a few months now. I got this recipe from Skinnytaste, and it is a sure-fire winner. Make this if you love buffalo sauce. If you don’t love buffalo sauce, still make it. This might just be the dish to change your mind. Preheat the oven to 450 degrees. In a bowl, mix together the flour, water and garlic powder. Coat the cauliflower in the flour mixture and place on a baking sheet. Bake for 20 minutes. Combine the melted butter and buffalo sauce and pour over the cauliflower. Bake for an additional 5 minutes. Serve with ranch or bleu cheese dressing. I’m smack dab in the middle of finals but am pulling my nose from my outlines to do a quick blog post. It’s doing things like this that reminds me that there are normal people out there who aren’t insane law school people who don’t shower and go through way too many highlighters. Side note – I never used up a highlighter before law school. Now I think I’ve gone through something like twenty. Law-school-proud. Anyhoo, yesterday was my Constitutional Law exam and after seven hours (SEVEN HOURS) of staring at the same questions, I was finally finished and promptly rewarded myself with a shower and milkshake. I can honestly say that I have never felt so gross as I did after that final. Pretty sure if I went and stood out on a street after that I would have passed as a homeless person. In case you were curious, I got a strawberry cheesecake milkshake from Sonic. It was everything I hoped it would be and more. I always love the few days after the first final because I find myself with a renewed desire to study. My inner mantra is, “Wow, that first exam was awful. Let’s make the next one less awful.” This of course is a ridiculous way to think because it’s law school. All the exams are awful. Only in law school is it totally normal to leave an exam thinking you failed it and then end up with an A. It’s all part of the game, though. You trudge through the two weeks of hell, gravitating between a can-do-spirit and paralyzing self-doubt. And then you get to the end and self-medicate with ice cream and Netflix marathons. Oh man, just saw my future there. Nothing has ever seemed more beautiful. My next final is property, and I am happy to say that the studying is not going too poorly. It’s funny when I look at my notes, though, and see all the things I didn’t learn about property. Like, you know, pretty much the entirety of landlord-tenant-law. I can tell you if a river is navigable, though. That’s going to be super useful. Only one week left though (6 days actually) until I am a free woman and can begin cooking and baking again! As I will have time (and my NEW camera!) expect lots of fun recipes in the next few weeks!!! !